The average commuter, however, should find this value-laden 4-door, still offered in 4 trims, the base LX, the lower midlevel EX, the sporty SX and the flagship Limited, packed with a pleasant combination of handsomeness and pizzazz that ought to once again ensure a perch near the top of the sedan niche. While exterior changes, though mild, have not been not met with a media-led standing ovation, inside, a few new extras, like selectable driving modes in the SX as well as some added comfort contours and padding in the front seats and a re-styled steering wheel, are welcome upgrades. Additional creature comforts and convenience bling for this year, depending on trim, include keyless ignition, rear parking sensors, new display screens and a blind-spot monitoring system. As well, trunk space lineup-wide remains a hefty 15.4 cubic feet, and the traditional split-folding rear seats, though still a bit cramped, offer a little extra toting capacity. Finally, this smart family automobile is once again available only with front-wheel drive (FWD). Powering the base LX, the EX and the normally aspirated SX trims is a 192-hp, variable-valve-timed 2.4-liter inline 4-cylinder (I4) engine that mates with the standard 6-speed shiftable automatic transmission for 181 lb-ft of torque. Mileage estimates with this efficient 4-banger run a not-too-shabby 23 mpg city/34 highway. Giving the turbocharged SX and the Limited their go is, once more, a blown 2.0-liter I4 powerplant that again uses the 6-speed shiftable automatic to pound down 274 hp and 269 lb-ft of torque. With those extra ponies, of course, comes a noticeable drop in fuel efficiency to a still-decent 20/30. And as mentioned, the turbocharged SX sub-trim now throws in driver-selectable modes to adjust power steering ratios and shift points to suit the mood of the daily commute. Standard appearance features and creature comforts in the base LX include 16-inch alloy wheels, heated power-adjustable mirrors, full power accessories, cloth upholstery, power lumbar adjustment for the driver’s seat, cruise control and telescoping tilt-wheel steering. Additional interior amenities include a brand-new 4.3-inch trip computer display, air conditioning, a cooled storage bin and Bluetooth hands-free calling, while entertainment remains offered via a single-CD player with 6 speakers, satellite radio and a USB port. To this the EX adds 17-inch alloy wheels, leather upholstery, a power-adjustable driver’s seat and an auto-dimming rear-view mirror. Leather and simulated wood cabin accents also adorn the midlevel EX, as does dual-zone climate control, while the SX tosses in a sport-tuned suspension, 18-inch alloy wheels, LED taillights, upgraded gauges and steering-wheel-mounted paddle-shifters. The top-shelf Limited, finally, throws a power sunroof and Kia’s touted Uvo infotainment and navigation, complemented by an 8-inch touchscreen, into the mix, as well as heated front seats and steering wheel, leather upholstery, memory for driver's settings, a rear-view camera, rear parking sensors and an 8-speaker Infinity premium sound system. Options for lower trims include a number of the high-end features that come standard in the higher trims, including a Premium Package (sunroof, heated leather seats, navigation, driver's memory settings) and a Technology Package (safety items) for the EX and SX trims, both of which come standard in the Limited. Notable standard safety items across the 2014 Optima lineup, meantime, include 4-wheel antilock brakes (ABS), traction and stability control, front side-mounted airbags, and front and rear head airbags. Further standard safety stuff on all trims includes turn-signal-integrated mirrors, front foglights (LED in the SX and Limited) and a remote antitheft alarm, with the SX and Limited trims additionally boasting new-this-year xenon high-intensity-discharge (HID) headlights and daytime running lights. The Limited additionally flaunts standard Uvo emergency assistance and alert communications technology as well. Also, the EX and SX can be equipped with the aforementioned optional Technology Package, which offers blind-spot alerts and rear cross-traffic warnings. 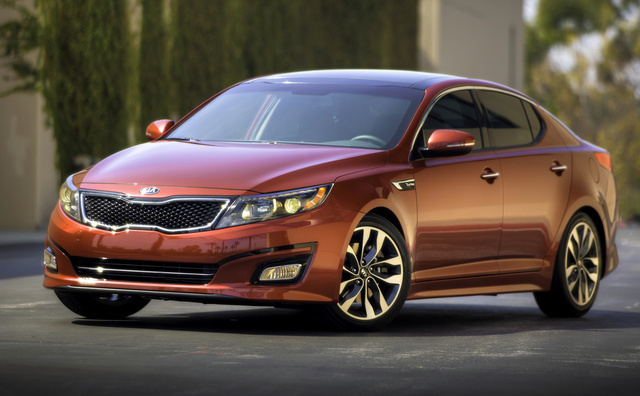 What's your take on the 2014 Kia Optima? Users ranked 2014 Kia Optima against other cars which they drove/owned. Each ranking was based on 9 categories. Here is the summary of top rankings. 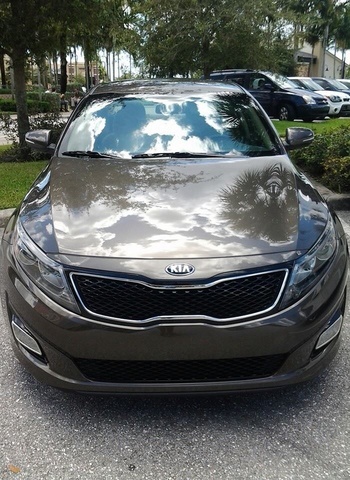 Have you driven a 2014 Kia Optima? 2014 Kia Optima Won't Start. All Lights Come In But Car Won't Start. My 2014 Kia Optima with a push bottom will not start. All of the lights come in inside the car, the radio works, and dash lights/indicators all work. Car itself will not start.